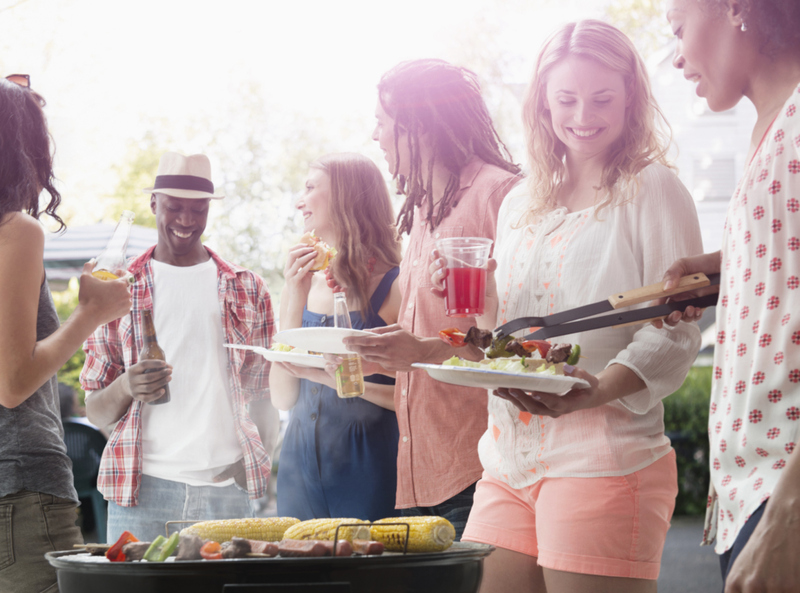 Every home cook who loves entertaining outside wishes they had more than just a grill. 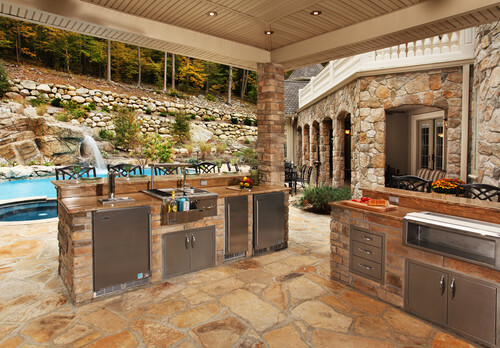 These outdoor kitchens are enough to make us all positively envious. 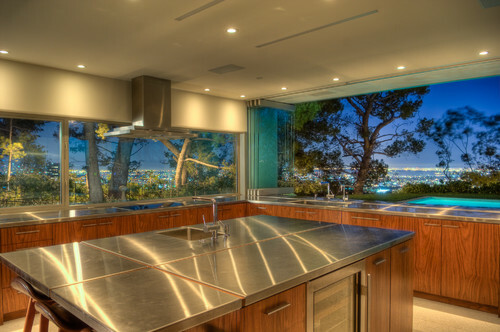 Featuring a folding window system that allows the cook to serve partygoers over the stainless steel bar, this kitchen boasts a scenic view of the pool and the twinkling lights of the LA Basin at night. 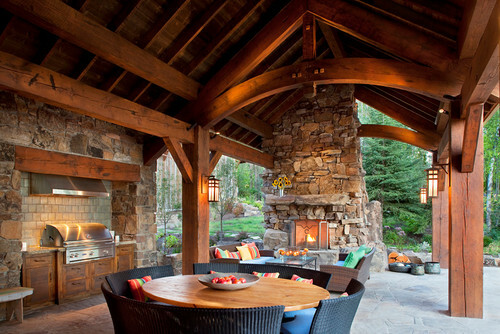 This lodge-style outdoor kitchen is anchored by a rustic rock fireplace with the grill subtly placed in the back surrounded by indoor kitchen-style cabinets — just close enough to chat with eager guests. For the cook who prefers never to leave her kitchen, but still wants to chat with guests, the tropical stylings of the bar-style seating in this kitchen is just as important as the view. 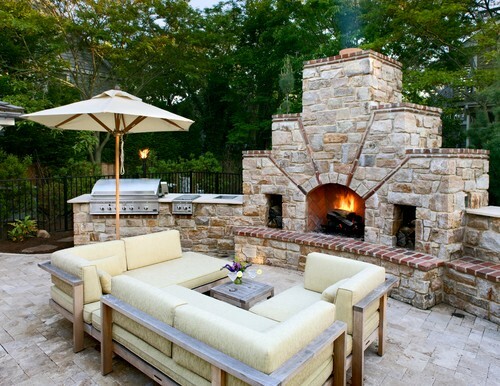 Modern Patio by Lake Forest Decks, Patios & Outdoor Enclosures Chicago Green Design Inc. 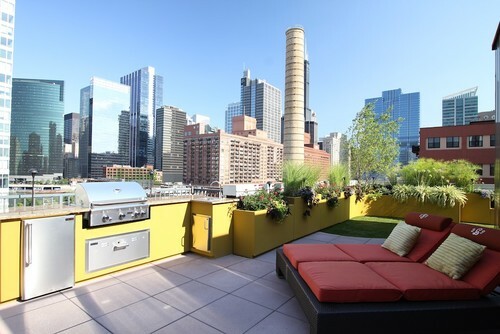 The deck space may be small, but the modern patio on this rooftop overlooking the skyline of the Windy City is seemingly secluded from the hustle and bustle below thanks to sunny yellow cabinets and a garden wall lined with Chicago-friendly greenery. 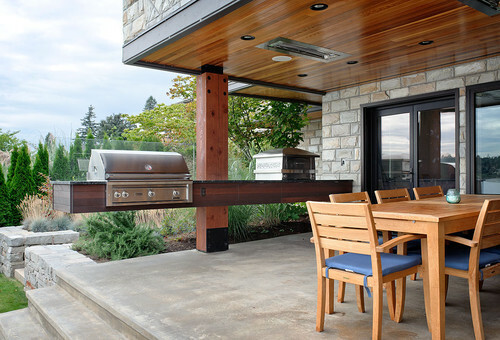 This cozy outdoor kitchen on the upper level of an estate is close enough to the master bedroom to provide a convenient space for a casual and intimate dinner for two — protected from the Seattle rain without obscuring your view of the stars on a clear night. 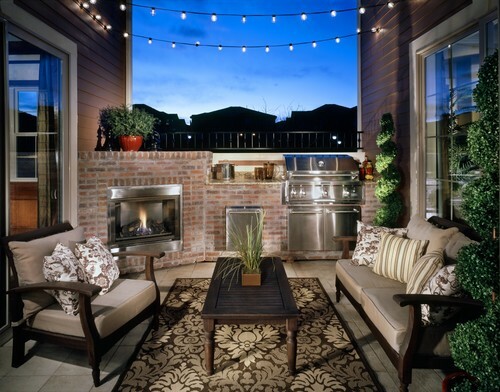 This outdoor patio kitchen in Denver is the ultimate in laid-back refinement punctuated with sculptured trees and festoon lights. 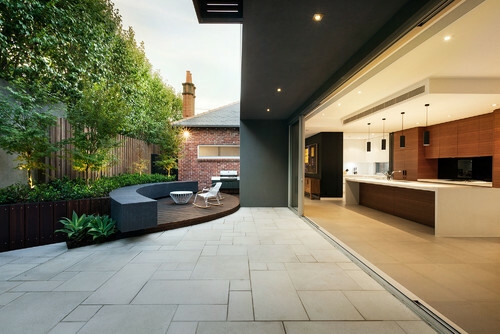 An enclosed patio in Brisbane, Australia, provides the perfect gray-scale transition from the indoors to outdoors. 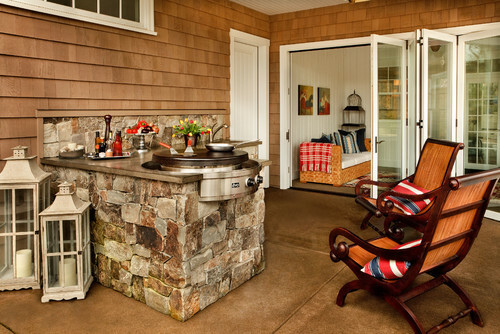 Traditional Patio by Portland Interior Designers & Decorators Garrison Hullinger Interior Design Inc.
Why waste your dough on a bunch of expensive extras? This Evo cooktop is so versatile you can cook burgers on the flattop surface while sautéing in a pan on the same surface just inches away. All for the low, low cost of around $4 grand. 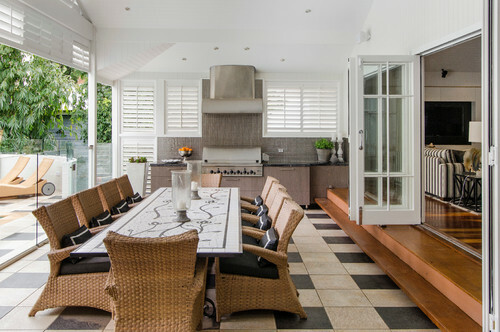 This minimalist semi-indoor kitchen has giant doors allowing it to transform into an outdoor kitchen with a few steps to the island bench seating area. 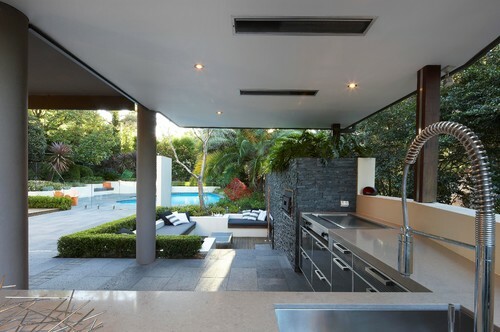 A contemporary kitchen features a pro-style faucet over a deep undermount sink and a gigantic cooktop leading down to a casual seating area overlooking the pool. 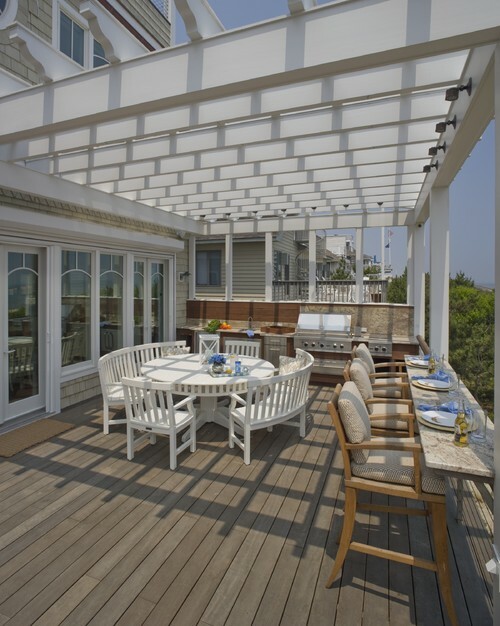 The rafters create all the drama needed in this deck design, meaning the furniture can remain understated and casual, and still allow you to host the fanciest brunch parties in town. 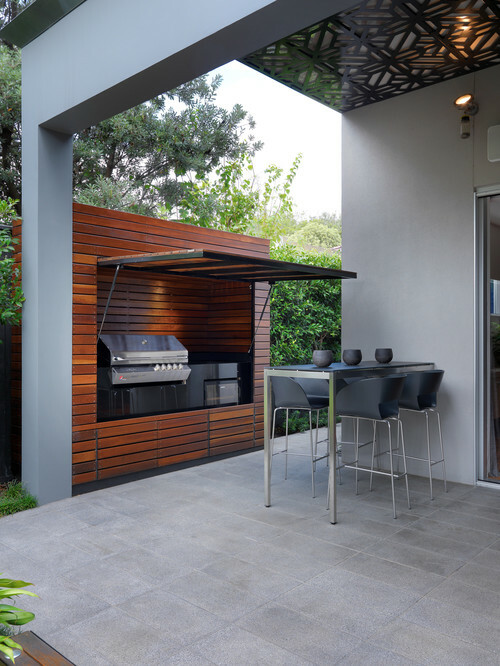 We love the floating grill and pizza oven in this subtle, contemporary design. 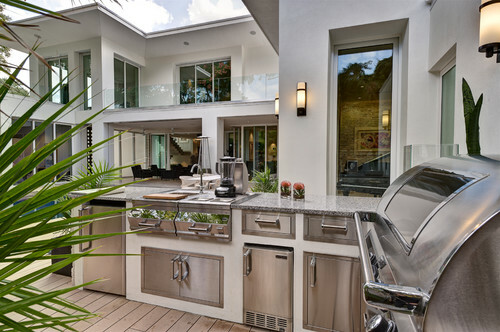 This high-end Florida-style kitchen has all the amenities of your indoor kitchen with a way better view. 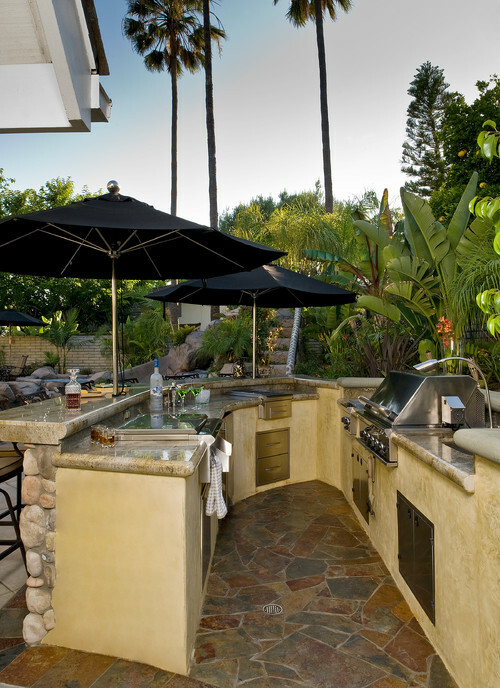 Contemporary Landscape by Newport Beach Landscape Architects & Landscape Designers AMS Landscape Design Studios, Inc.
You can’t get more LA than an outdoor kitchen that blends seamlessly into the natural beauty that proves Californ-y is more than just swimmin’ pools and movie stars. 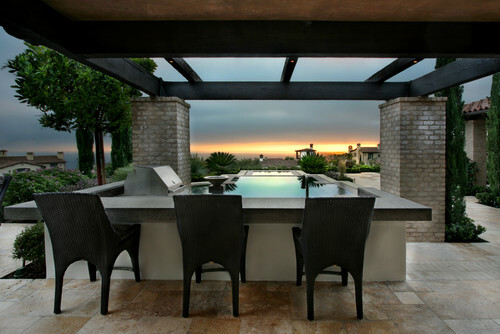 If entertaining is your reason for living, this discreet outdoor kitchen is part of an overall outdoor living area anchored by a contemporary wrap-around couch with a Tuscan-influenced fireplace feature that’s perfect for roasting marshmallows. Natural stone and a water-feature view make stainless steel appliances stand out, but we can’t help but notice the handy booze bottle holder hanging off the sink. 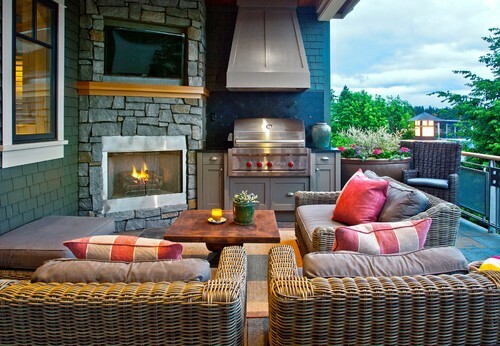 Can you imagine getting up every day and making breakfast outdoors and eating it in this casual little breakfast nook? Our favorite parts are the glorious cut-out design ceiling and the sleek, simple wood for the hideaway kitchen. 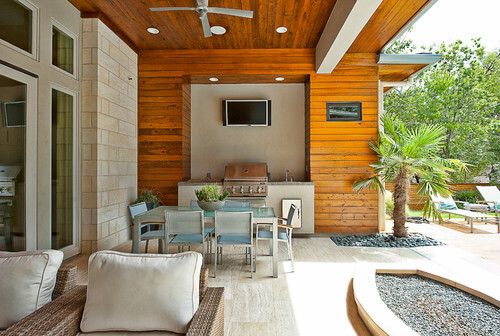 This eco-friendly patio kitchen was made from 95 percent reused or reclaimed materials, but it’s anything but piecemeal. We love the way the blue-gray in the rocks is highlighted by the subtle blue in the chairs and how it’s all balanced by the warm wood in the drama wall and ceiling.